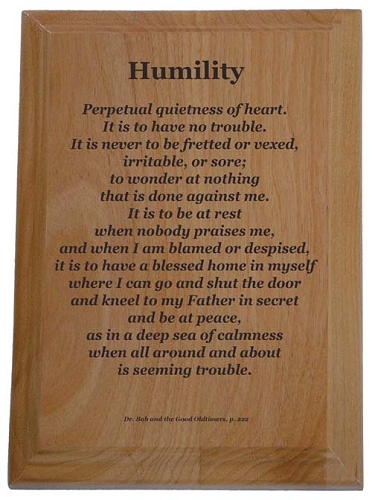 A wonderful passage from "Dr. Bob and the Good Oldtimers," this Humility Plaque is a perfect reminder of one of the important spiritual principles we work toward on a daily basis. Humility: Perpetual quietness of heart. It is to have no trouble. It is never to be fretted or vexed, irritable, or sore; to wonder at nothing that is done against me. It is to be at rest when nobody praises me, and when I am blamed or despised, it is to have a blessed home in myself where I can go and shut the door and kneel to my Father in secret and be at peace, as in a deep sea of calmness when all around and about is seeming trouble. Suitable for hanging in any room, office, or meeting hall. All plaques are "key-holed" on the back for mounting on the wall. Or, they can be displayed on a table, desk or shelf with one of our Plaque Display Easels.